Le Moulin de Beaumont is situated on its own, just 20 minutes from the beautiful Atlantic beaches, 3 golf courses, and in an area steeped in history. This typical old stone Charentaise mill house has been fully renovated to provide a light, airy place to stay with all modern facilities. Set within two acres, the moulin benefits from a secluded walled and terraced, private heated salt water pool, which has ambient lighting so you can swim all night or just enjoy balmy warm evenings by the pool. All the moulin's facilities are for the sole use of the guests. Its 3 bedrooms, bathroom, additional en suite shower room, open plan well equipped kitchen/dining/living area, sitting room with wood burner, sofas and a further sitting room with French 'day bed' for those afternoon snoozes means there is plenty of space to enjoy the charms of this mill house. With central heating and double glazing for the cooler months, Le Moulin de Beaumont really is the perfect place to stay all year round. 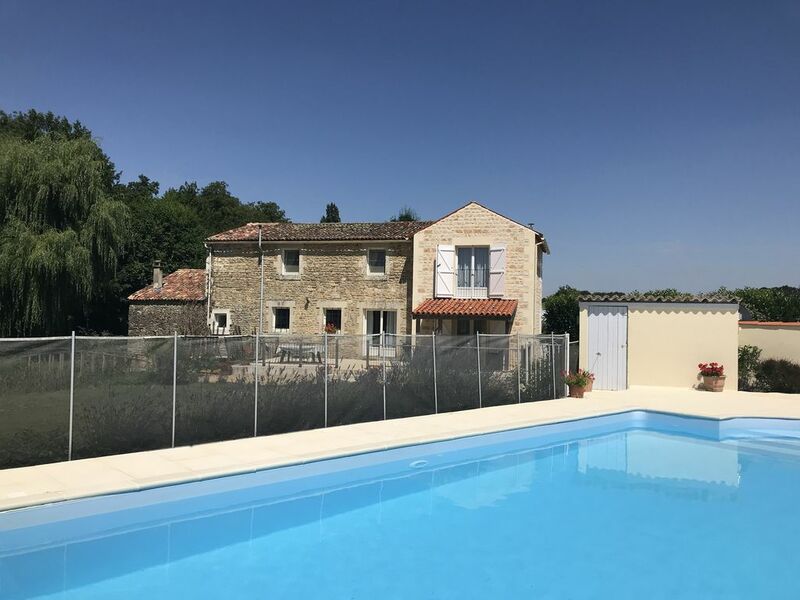 Le Moulin's Exclusive Use of Heated Pool & Gardens: Le Moulin de Beaumont's guests have exclusive use of pool and gardens; they are not shared, like many other houses and there is no owner on site or living next door. It really is just for you to relax in. Its peaceful setting is surrounded by open countryside, where farmers grow fruit and vegetables along with sunflowers and vines. The stream, with a woodland backdrop, forms a wonderful natural border along one whole side of the garden. The old millstream itself still runs under the garage and through the garden and can be crossed by a charming wooden bridge.The garden has proved to be a wildlife haven and is often home to families of ducks, moorhens and coots. Kingfishers are also regular visitors and upstream a family of otters have been spotted. If you're up early enough you may well see the deer who come to drink from the stream. There is also plenty of space for balls games, badminton, boules etc, too - all of which are provided. Coast/Beach: The nearest beaches are about 20 minutes away by car at Meschers. These are small coves with sandy beaches which are perfect for younger members of the family to go rock pooling and experience gentle waves. Further along the coast at St Georges de Didonne & Royan, there are huge sweeping beaches with lots of space, some water sports & full safety patrols. North of Royan is the Grand Cote - several miles of sandy beaches with some local beach patrols & a little further is the Cote Sauvage, with good sandy beaches but where the rollers come in off the Atlantic and therefore, perfect for surfers. The three islands, Ile de Re, Ile d'Oleron and Ile D'Aix off the coast of the Charente Maritime, are particularly interesting for lovers of the coast and sea and each has its own different characteristics. Cycling, Walking, Places to Visit: With over 2500km of cycle routes in the Charente-Maritime, many quiet lanes to cycle along, as well as a great cycle track through the pine trees at the Grand Cote, there couldn't be a better way to discover the area. It is also possible to hire bikes which can be delivered straight to the mill house for your convenience. (There are also a couple you can use at the mill house.) Guests have found it is the perfect area for cycling, especially as it is fairly flat with gentle hills. Along with cycle there are many walks along the cliff tops are breath taking and not to be missed. A series of guide books and maps of trails are available at tourist offices, as well as at the mill house. There are so many wonderful places to see in this interesting region of France with its rich Roman and Medieval history. The Moulin has several excellent guide books, along with a folder containing alsorts of information on places to visit, sites to see and restaurants to dine in. The bathroom is fully tiled and complete with corner bath with hand held shower, separate shower cubicle, washbasin and WC. Ensuite has shower, washbasin and WC. The tumble dryer is for winter guests only. All towels are provided but we ask guests to bring their own pool/beach towels. Beach towels can be provided for guests who fly to the moulin at a small additional cost. One in the kitchen and a separate fridge with freezer compartment can be found in the utility room. Open plan kitchen/living area has most necessary mod cons needed to make your stay a comfortable one. There is all the usual kitchen equipment, including a microwave and dishwasher. The large kitchen serves as a dining area also, along with the outside terrace for al fresco dining. Although the property is not suitable for wheelchairs due to width of doorways, it is excellent for anyone with slight mobility problems as there is a downstairs bedroom and bathroom. Children are most welcome at Le Moulin but parents must take full responsibility for the safety of themselves, their children and any older relatives with regard to the dangers of being close to open water - namely, the stream and millpond opposite the house. There are fans available in every room. Can’t speak highly enough of le moulin-the house is well equipped,clean and spacious, and the pool was brilliant for all the family. The welcome basket was a very pleasant surprise, probably the most generous we have ever experienced. We particularly enjoyed the abundance of wildlife, my 7year old daughter loved our evening frog walks by the stream, and waiting for the bats to come out. Three generations of our family returned home tanned and relaxed! We're so pleased to hear the moulin suited all three generations of your family. Fortunately, due to the location and the consideration of guests like you, we're blessed with an abundance of wildlife in the garden. We hope to welcome you all back to the moulin one day. On arrival we were overwhelmed by the generous welcome pack of food and wine...These thoughtful touches were evident throughout our stay with the inclusion of toiletries and a useful folder covering appliances guides and day trip/ shopping information. The mill was immaculately clean and well maintained with every conceivable requirement covered. The gardens were vast and provided plenty of entertainment - big enough for cricket playing, even! The pool (I confess to feeling dubious of a solar heating type) was amazing- the best yet in all our trips to villas. We ventured out on the bikes to the boulangerie, which was only 10 minutes away, and most welcoming. I would strongly recommend this property as there is something for all ages. The downstairs bedroom and bathroom layout makes it a versatile choice. We have been raving about the whole experience- book it early to avoid disappointment! Thank you for your lovely review; we feel quite humbled. It's so good to know that we got it 'right' for your family in order to feel relaxed and comfortable as soon as you arrived. We are also very fortunate to have found excellent managers who understand our ethos and made the moulin 'immaculately clean’ and inviting for your stay. This is the nicest villa we have ever stayed in. It was bright, clean, comfortable , spacious and very private. It is close enough to a local bakery for morning croissants, and only 10 minutes from the supermarket. Lovely beaches and towns within 40 minutes drive. The pool was nice, and warmed up the second week which was a great bonus. Thank you so much for taking the time to write such a kind review. It's so rewarding to hear it is the nicest villa you have stayed in and we're pleased to hear the solar panels heated the pool for you to enjoy it. We very much hope to welcome you back one day soon. We have stayed at the Moulin three times, in June, September and April and we have always enjoyed our stay. It is always spotlessly clean and very well equipped. With a large garden and private pool it's perfect. The Moulin is in a lovely quiet area with an abundance of wildlife including kingfisher which we had not seen before. There are good beaches nearby and culture vultures won't be disappointed either as there are historic places to visit too. Don't take our word for it, just book it! Many thanks for your kind review. We are pleased you have seen the kingfisher, who frequents the stream to see what he can find swimming in it. Thank you also for always leaving the moulin so clean and tidy when you leave and we hope to welcome you back before too long. A beautiful setting and a house which is better equipped than most holiday places. Great with small children and lots of extras such as badminton in the garden and pool toys. Lovely area to explore and good beaches too. Thank you for taking the time to post a review; it is much appreciated. We are so pleased you enjoyed your stay and very much hope to welcome you and your family back one day. My partner and I have just returned from this property and can honestly say that it is one of the prettier properties we have rented. The atmosphere of the property and the area is relaxing and the property itself is spotlessly clean, well looked after and a real home from home. We would have no reservations at all to recommend this to all interested parties. The Charente Maritime, with its own micro-climate, equals the South of France for sunshine hours. Its sweeping vineyards produce grapes for the famous Cognac brandy and Bordeaux wines. The brandy houses of Hennessey, Remy Martin and Martell are based at Cognac and provide guided tours of their distilleries, offering a sample or two to taste or take away. La Palmyre Zoo, just beyond Royan, is a must see for adults and children alike. With a world renowned breeding programme, there are always lots of young animals to see and pet. La Roche Courbon Chateau is one of the many Chateaux in the area not to be missed. At Poitiers, Futuroscope is a colourful state-of-the-art park with a 3D cinema and latest in visual technology. From beaches with miles of golden sand to historical ports,such as La Rochelle, oyster farms, blue lakes, winding rivers and lanes, the idylilic islands of Ile de Re and Ile d'Oleron and Roman sites, this area of France really does have everything to offer. Golf: There are good 18 hole courses in Saintes, Cognac, Pons and Royan. At Royan the golf course nestles amongst the pine forest, incorporating an 18 hole main course with a separate 6 hole pitch and putt course too. The course at Cognac is surrounded by vineyards with each holes named after a different cognac! Make sure you are feeling fit and ready for a challenge if you decide to play at Saintes as it is rather a hilly course. All the courses also boast excellent restaurants. With the excellent micro climate of the Charente Maritime and most of the courses open all the year round, golf is a real pleasure whenever you choose to visit. Payment in Sterling or Euros. House hunting and extended winter lets available out of season (Chez Moulin is centrally heated and double-glazed). Please enquire for special long term rates. The price of your stay includes all bed linen, bath and tea towels, (excluding pool/beach towels), a welcome basket, bicycles and utilities*. (*Excludes winter lets and winter rentals.) For further information please see our website.